The current banner image for this blog and for Celestial Timepiece is taken from HubbleSite, run for NASA by the Space Telescope Science Institute. 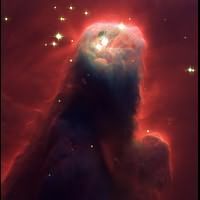 STScI titles the image “Cone Nebula (NGC 2264): Star-Forming Pillar of Gas and Dust,” and further describes it as “a nightmarish beast rearing its head from a crimson sea”—as if this were not obvious to anyone familiar with nightmarish beasts. Or crimson seas.